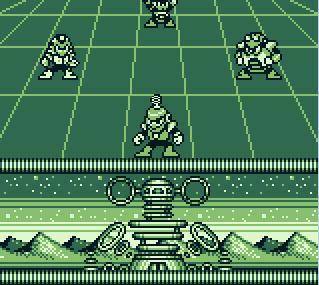 The first three Mega Man games for the Game Boy were, for better and for worse, experiments with what Capcom could do with the hardware. It may seem excessive for a company to take three attempts to create a truly great platformer but the results ended up being worth it. As Nintendo did with creating the mediocre Wario Land 1, 2 & 3 to make the excellent Wario Land 4, Capcom blows the previous Mega Man games out of the water with Mega Man IV. From the start you can tell that this game has more effort put into it than the other three games combined. 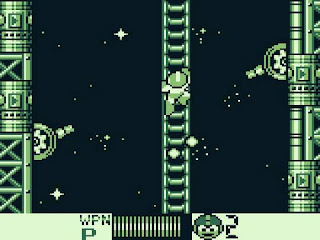 The game begins with an opening cinematic that's surprisingly engaging for something that works with the Game Boy's limited colour palette. The Mega Man formula is also as fun as it's ever been but there are slight alterations that change the game, ultimately for the better. The charged shot from Mega Man III returns, the difference being that firing the shot pushes you half of a pixel back. This seems superficial but when you're on a platform with no room to move, this half of a pixel is the difference between life and death (A trend first introduced with the recoil of the gun in Air Fortress). Another trend beginning in Mega Man IV is the introduction of the shop. The shop was a brand new idea for the Mega Man series as a whole, and has been the series' way of compromising between difficulty and challenge by selling items that would give the player a boost if they ever felt like the game was too difficult to them. The only thing recycled from the original series are the boss battles. It continues the tradition set in II & III of taking half of the bosses from the NES equivalent (Mega Man IV in this case) and half from Mega Man V for the NES. These bosses are the only major problem with the game. While they're good rehashes, they are still just rehashes of bosses that most Mega Man fans have already fought (The Dr. Wily Fortress on the other hand is the best in the entire series). Mega Man IV is the first in the Game Boy series that can be called to some extent "good." However, the true crown jewel of the series was still to be found.